Secretary General of the Communist Party of Spain (PCE) 1944-1960. Ibárruri was born December 9, 1895 in Gallarta, Vizcaya in the Basque Country of Spain. She was the eighth of eleven children and grew up in an impoverished mining family. She showed promise in her studies in primary school, but her family was unable to afford to provide her with the education necessary to train her as a teacher and she instead learned to be a seamstress. Ibárruri married miner and activist Julián Ruiz in 1916. Ruiz was imprisoned for political activities in 1917 and during his imprisonment, Ibárruri became familiar with the works of Marx and Engels, studying their writings and ultimately joining the PCE. She adopted the pseudonym of "La Pasionara" ("The Passion Flower") while writing for the miners' newspaper El Minero Vizcaíno ("The Biscayan Miner"). Ibárruri was famously known by this pseudonym for the rest of her life. Ibárruri was elected to the Provincial Committee of the Basque Communist Party in 1920 and to the Central Committee of the PCE in 1930. She began writing for the newspaper Mundo Obrero ("Worker's World") in 1931 and mounted a campaign for the improvement of conditions for Spanish women. In 1931, Ibárruri was arrested for harboring a fellow communist who was wanted by the Spanish Civil Guard. She was arrested and held for approximately four months but shortly after her release, she was arrested again and held for almost one year. Following her release from jail, Ibárruri served as part of the Spanish delegation to the Communist International in 1933. In 1934, she helped to organize the World Conference of Women Against War and Fascism and she served as a delegate to its first conference in 1934. She was elected to Spain's Cortes (national legislative assembly) in 1936. Ibárruri served as one of the main propagandists for the Republicans during the Spanish Civil War. She is best known for uttering the famous words "¡No Pasaran!" meaning "They (the fascists) shall not pass!" during a radio address made at the height of the Battle of Madrid. Following the fall of Madrid to Franco's forces in 1939, Ibárruri went into exile in the USSR where she was granted Soviet citizenship. She continued her political activity while living in the USSR and she was named General Secretary of the PCE in 1944. Ibárruri was awarded the Lenin Peace Prize in 1964 and she received the Order of Lenin in 1965. 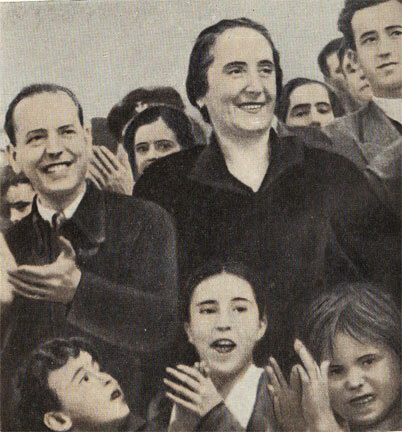 Dolores Ibárruri returned to Spain in 1977, a short time after the death of Francisco Franco. She was again elected to the PCE at the age of 81. She died of pneumonia on November 12, 1989.